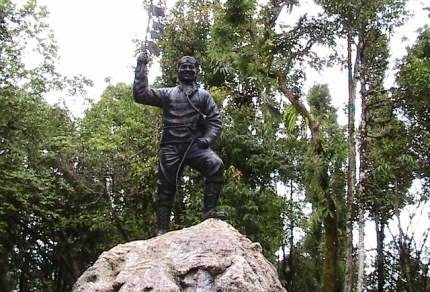 Darjeeling, Feb. 13: The Himalayan Mountaineering Institute's decision to shift the statue of Tenzing Norgay Sherpa from the current location on the campus mainly because cracks have developed in the surrounding areas has "hurt" the Sherpas' "sentiments" who said they were not informed about the move. The HMI is shifting the statue from the present location to a site about 20 feet away. P.T. Shepra, vice-president of United Sherpa Association and also the general secretary of Sherpa Buddhist Association, said: "Tenzing Norgay Sherpa is our community's greatest hero. The sentiments of the entire community are attached to Tenzing Norgay and the HMI's decision to shift the statue without informing the community has hurt our sentiments." Sherpa added that the HMI should have informed the community about the plan to relocate the statue. Col. Gulshan Chadha, principal of the HMI, speaking over the phone from Dirang, Arunachal Pradesh, said he would invite the members of the community for a meeting on February 22 to address their grievances. He said the announcement to renovate the area was made during the 100th birth anniversary of Tenzing Norgay in Darjeeling last year. The HMI principal said the statue was being shifted for a number of reasons. "Near the place where the statue presently stands lies an underground water reservoir. Even though it is not in use, we have found that cracks have developed in the surrounding areas. The HMI museum which was built at a cost of Rs 5 crore and has artefacts worth more than Rs 5,000 crore has tilted 12 degrees to the left. If we do not do anything, the entire HMI premises' safety will be at stake," said Chadha. "Moreover, we are shifting the statue to such a place that a visitor can see the cemetery, statue and museum at one glance. At the present location of the statue, a person paying obeisance to Tenzing's cemetery will have his rear turned to the statue. According to the present plan, a person paying obeisance to the cemetery will also be facing the statue and the museum," said Chadha. Himalayan Mountaineering Institute's decision to shift the statue of Tenzing Norgay Sherpa from the current location on the campus mainly because cracks have developed in the surrounding areas has "hurt" the Sherpas' "sentiments"